The Mexican Navy's stated mission is "to use the naval force of the federation for external defense, and to help with internal order". The Navy consists of about 75,124 men and women plus reserves, over 189 ships, and about 130 aircraft. The Navy attempts to maintain a constant modernization program in order to upgrade its response capability. Given Mexico's large area of water (3,149,920 km2 (1,216,190 sq mi)) and extensive coastline (11,122 km (6,911 mi)), the Navy's duties are of great importance. Perhaps its most important on-going missions are the war on drugs and protecting PEMEX's oil wells in Campeche in the Gulf of Mexico. Another important task of the Mexican Navy is to help people in hurricane relief operations and other natural disasters. 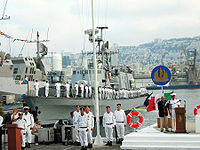 The Mexican Navy has its origins in the creation of the Ministry of War in 1821. From that year until 1939 it existed jointly with the Mexican Army in the organic ministry. Since its declaration of independence from Spain in September 1810, through the mid decades of the 19th century, Mexico found itself in a constant state of war, mostly against Spain which had not recognized its independence. Therefore, its priority was to purchase its first fleet from the U.S. in order to displace the last remaining Spanish forces from its coasts. The President of Mexico is commander in chief of all military forces. Day-to-day control of the Navy lies with the Navy Secretary, Vidal Francisco Soberón Sanz. In Mexico there is no joint force command structure with the army, so the Secretary reports directly to the President. The Navy has a General Headquarters and three naval forces. There are furthermore eight regions (four on the Pacific coast, three on the Mexican Gulf coast and the Región Naval Central, grouping the naval forces, based in and around the capital Mexico City, such as the 7th Naval Infantry Brigade, the Central Special Operations Group and the Air Transport Squadron), thirteen zones, and fourteen naval sectors. Officers are trained at the Mexican Naval Academy, called the "Heroica Escuela Naval Militar" ("Heroic Military Naval School"), located in Antón Lizardo, Veracruz. Mexican marines displaying three different camouflage patterns used by the Mexican marine corps. 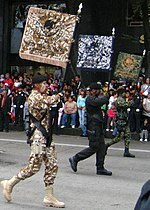 The Mexican Naval Infantry Corps was reorganized in 2007–2009 into 30 Naval Infantry Battalions (Batallones de Infantería de Marina – BIM), a paratroop battalion, a battalion attached to the Presidential Guard Brigade, two Fast Reaction Forces with six battalions each, and three Special Forces groups. The Naval Infantry are responsible for port security, protection of the ten-kilometer coastal fringe, and patrolling major waterways. The Naval Infantry also is responsible for 23 National Service Training Units under the responsibility of the Navy Secretary, enforcing the National Service obligation for Mexicans of teenage and young adult age. In 2008, the Mexican Navy created its new search and rescue system, allocated in strategic ports at Pacific and Gulf of Mexico ports, to provide assistance to any ships which are in jeopardy or at risk due to mechanical failure, weather conditions or life risk to the crew. To provide such support, the Navy has ordered Coast Guard Defender class ships (two per station, and one 47-Foot Motor Lifeboat coast guard vessel). Other stations will be provided only with Defender-class boats. On April 1, 2014 SEMAR officially announced the creation of Port Protection Naval Units (Unidades Navales de Protección Portuaria: UNAPROP) which will include a marine section. The main task of UNAPROPs is to ensure maritime surveillance and inspection. It is the school where future officers are trained for the General Corps of the Navy. Candidates can enter upon completing high school. Upon completion of studies, graduates obtain the degree of Corbeta Lieutenant and the title of Naval Science Engineer. This school Located in Mexico City, offers a career in medicine. Officers are trained with skills for the prevention and health care of naval personnel. By adopting a professional examination, graduates can obtain the degree of Naval Military Lieutenant Corvette. In the Naval Engineering School, officers are responsible for the preventive and corrective maintenance of systems and electronic equipment installed on ships and installations of the Mexican Navy. This school offers career of Electronic Engineering and Naval Communications. It is located between the town of Mata Grape and Anton Lizardo, 32 km (20 mi) from the port of Veracruz. Here the time to achieve a nursing degree lasts eight semesters. Officers are trained with the knowledge and skills necessary to enable them to assist medical personnel in caring for patients in hospitals, sanatoriums, clinics, health sections on land, aboard ships and at The Naval Medical Center. The Naval Aviation School trains pilots for the Mexican Naval Aviation as well as staff from the Federal Preventive Police and Naval personnel from various countries of Central America. This school is located on Veracruz. 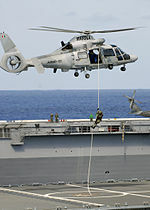 Located in Acapulco, members of The Navy are trained for marine search, rescue and diving. It also trains state police officers and firefighters. The annual Navy's budget is in a one to three proportion of the national budget relative to the Mexican Army and Mexican Air Force. The Navy has a reputation for being well-run and well-organized. This reputation allows for a close relationship with the United States Navy (USN), as evidenced by the procurement of numerous former USN ships. The Secretary of the Navy, Admiral Francisco Saynez Mendoza, announced on October 1, 2007, detailed plans to upgrade and modernize the country's naval capabilities. On the following day, La Jornada newspaper from Mexico City, disclosed the Mexican Navy plans, which are among others, to build six offshore patrol vessels (OPVs) with a length of 86 metres (282 ft), 1,680 tons and each housing a Eurocopter Panther helicopter as well as small high-speed interception boats. The budget for this project is above US$200 million. Another project is to build 12 CB 90 HMN high speed (50 knots (93 km/h; 58 mph)) interception boats under license from a Swedish boat company to the Mexican Navy. Also, a number of fully equipped planes for surveillance and maritime patrol are being considered. Combinations of options and development are being defined. The Mexican Navy initiated studies to develop and construct its first missile, according to a May 2005 interview with the undersecretary of the Navy, Armando Sanchez, the missile was to have an average range of 12 to 15 kilometres (7.5 to 9.3 mi) and be able to target enemy ships and aircraft. The undersecretary added that they already had the solid propellant, and the basic design of the missile. All aspects relative to their fuselage were solved as well as the launch platforms. The Mexican Navy was developing the software to direct the missile to its target. In July 2008, the project was reported to be 80% complete. Despite this effort, the missile development was canceled in 2009 due to "problems with the propulsion system". In 2009, the Mexican Navy began operating a batch of new MPQ-64 Sentinel radars in the oil-rich Gulf of Mexico. The radar network was installed in 2007 for a trial phase while military personnel were trained to get familiar with the system. The new installations will work together with combat surface vessels that patrol the area. Mexico - Ships being built in The Netherlands and Mexico. At least 8 ships planned for fleet modernisation plan. TBD class Supply ship BAL11 Isla Madre Launched July 11, 2016. The Mexican Navy includes 60 smaller patrol boats and 32 auxiliary ships. It acquired 40 fast military assault crafts, designated CB 90 HMN, between 1999 and 2001 and obtained a production license in 2002, enabling further units to be manufactured in Mexico. For the year 2008 budget, the Mexican Congress approved a US$15 million fund to build only 17 out of the 60 combat boats requested. These ships, designated CB 90 HMN, are to increase the Mexican Navy's fast boat fleet. Additional budgets will be awarded each passing year. In total, the Mexican Navy has over 189 operational ships. In January 2013, the 112th Session of US Congress authorized the transfer of the Oliver Hazard Perry-class frigates USS Curts and USS McClusky to the Mexican Navy, but due to the cost of overhauling the vessels and the removal of all the weapons systems and most of the electronics and radar gear by the USN prior to transfer, this is still undecided by Mexico. The offer expired on 1 January 2016. On March 25, 2014 Beechcraft Corporation received an order of 2 T-6C+ military trainers from the Mexican Navy. 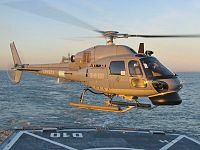 On June 24, 2014 the Mexican Government requested the purchase of 5 UH-60Ms in USG configuration from the U.S.; its estimated cost is $225 million. Also on June 24, BAE Systems announced it was awarded a contract by the Mexican Government to supply the navy with 4 Mk 3 57mm naval guns, for the ships of the Reformador class. ^ "Día de la Marina". sct.gob.mx. Archived from the original on 31 May 2015. Retrieved 24 December 2014. ^ "Secretaria de Marina – Armada de México". Archived from the original on 24 September 2015. Retrieved 24 December 2014. ^ "History of the Mexican Navy ships". Archived from the original on 2010-01-10. Retrieved 2017-04-01. ^ "Textron Systems Brand Change". Archived from the original on 13 June 2009. Retrieved 24 December 2014. ^ "Mexican Navy increasing coast guard capabilities". Jane's. Archived from the original on 24 December 2014. Retrieved 24 December 2014. ^ Noticieros Televisa. "Crea Marina Unidades Navales de Protección Portuaria". televisa.com. Archived from the original on 24 December 2014. Retrieved 24 December 2014. ^ "Unidades de Marina vigilarán 19 puertos del país a partir del martes". Excélsior. Archived from the original on 24 December 2014. Retrieved 24 December 2014. ^ "En marzo iniciarán operaciones radares de la Armada" (in Spanish). NOTIMEX. December 27, 2008. Archived from the original on December 29, 2008. Retrieved December 27, 2008. ^ "ThalesRaytheonSystems receives contract to support Mexican homeland security, protect Gulf oil infrastructure". Thales Raytheon Systems. May 11, 2006. Archived from the original on October 13, 2008. Retrieved 2008-12-27. ^ "Fourth Damen Stan Patrol 4207 patrol vessel for Mexican Navy". August 23, 2013. Archived from the original on September 15, 2013. Retrieved August 23, 2013. 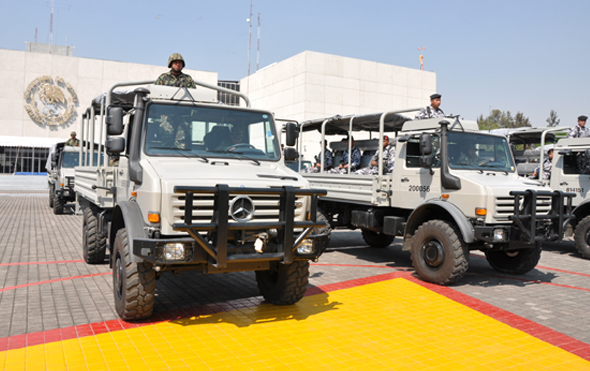 ^ "Mexican Navy contracts Damen for fifth Tenochtitlan-class Patrol Vessel (Stan Patrol 4207)". December 12, 2013. Archived from the original on December 18, 2013. Retrieved December 18, 2013. ^ "Mexican Navy orders sixth Tenochtitlan-class Patrol Vessel (Stan Patrol 4207) from DAMEN". April 1, 2014. Archived from the original on April 7, 2014. Retrieved April 4, 2014. ^ "4° Informe de Gobierno" (PDF). Presidencia de la República. 1 September 2016. Archived (PDF) from the original on 16 September 2016. Retrieved 2 September 2016. 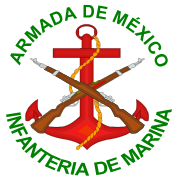 ^ a b "Secretaria de Marina – Armada de México". Archived from the original on 24 September 2015. Retrieved 24 December 2014. ^ "Recibe Semar vehículos para incrementar capacidad operativa". EL INFORMADOR. Archived from the original on 29 December 2016. Retrieved 24 December 2014. ^ Aranda, Jesus (14 December 2009). "La flota de Ejército y Armada consta de 480 aeronaves". La Jornada (in Spanish). Archived from the original on 28 November 2011. Retrieved 14 December 2009. ^ Raúl Benítez Manaut; Abelardo Rodríguez Sumano; Armando Rodríguez Luna (2009). Atlas de la Seguridad y la Defensa de México 2009. México D. F.: Colectivo de Analisis de la Seguridad con Democracia (CASEDE). pp. 369 pp. ISBN 978-607-95380-0-2. Archived from the original on 2010-02-24. ^ "Mexican Navy Places Initial Order for Beechcraft T-6C+ Trainers". April 3, 2014. Archived from the original on April 7, 2014. Retrieved April 4, 2014. ^ a b "Beechcraft". Beechcraft Newsroom. Archived from the original on 24 November 2014. Retrieved 24 December 2014. ^ "Photo Search Results". Archived from the original on 13 July 2010. Retrieved 24 December 2014. ^ "Persuader Patrol Planes for Mexico's Maritime". Defense Industry Daily. 17 May 2012. Archived from the original on 25 December 2014. Retrieved 24 December 2014. ^ "La Armada de México recibe once aeronaves decomisadas al narcotráfico – Noticias Infodefensa América". Infodefensa.com. 13 November 2014. Archived from the original on 13 November 2014. Retrieved 24 December 2014. ^ "Sikorsky UH-60M Black Hawk Helicopters for Mexico". April 22, 2014. Archived from the original on April 27, 2014. Retrieved April 27, 2014. ^ "Global Defence News and Defence Headlines – IHS Jane's 360". Archived from the original on 2 June 2010. Retrieved 24 December 2014. ^ It was published within the Chapter 13 of the SEMAR 2008 final budget, by the SHCP, the Mexican finance ministry for this period. ^ a b "H.R. 6649 (112th): Naval Vessels Transfer Act of 2012". USA 112th CONGRESS, 2nd. session, H. R. 6649. govtrack.us. January 1, 2013. Archived from the original on March 23, 2013. Retrieved April 13, 2013. ^ "Textron – Mexican Navy places initial order for Beechcraft T-6C+ trainers". Archived from the original on 24 December 2014. Retrieved 24 December 2014. ^ "Mexico – UH-60M Black Hawk Helicopters – The Official Home of the Defense Security Cooperation Agency". Archived from the original on 24 December 2014. Retrieved 24 December 2014. ^ "Newsroom – BAE Systems". Archived from the original on 24 December 2014. Retrieved 24 December 2014.